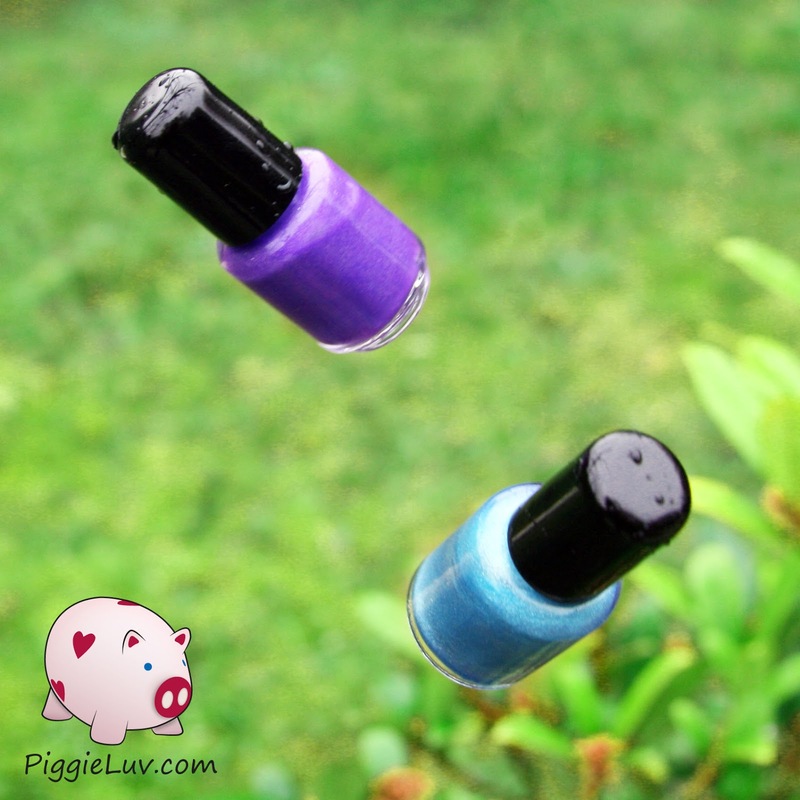 PiggieLuv: Pretty & Polished is ready for sunny spring weather! Pretty & Polished is ready for sunny spring weather! But aaaanyway... I have two Pretty & Polished beauties to show you today! They're called My Friend Dahlia and Disguise The Limit and they are for the Spring FX collection that will be released on March 1st. Click to see them! My Friend Dahlia is a gorgeous jelly that surprised me, because I had no idea it was a thermal! I found that out while I was swatching it, I applied the first coat and it turned pink on my nail bed, while the tip stayed purple. Such an awesome surprise! This beautiful polish is a deep purple shade in the bottle, this is the color of the cold polish. It changes with temperature, so the strength of the transition may change between swatches. This is my first time taking swatch pics of a thermal, so cut me some slack! I applied three coats of this jelly to get this opaque look. No top coat! Something that surprised me about My Friend Dahlia was that she stayed pretty matte. I really like this effect so I didn't feel like adding a top coat. I usually do add a quick drying top coat to speed up the hardening of the polish. Because of my excitement of discovering the thermal effect, I started pretty much glopping the polish on, not taking the time to wait for my coats to dry. So I thought I would need a quick drying top coat for sure but to my surprise, it dried on its own faster than you can say 'supercallifragilisticexpialidocious'! And here's the complete color transition to cold! I stood outside for a while just to be able to take this picture, and I was freezing XD That's probably why my fingers look frozen as well, MAN was I cold! Anyway, this is a gorgeous color, which makes it a perfect match with the warm magenta state of the polish. You can't wear a thermal polish when you don't like on of the color states. You'll be walking around with a poop color half of the time! And ofcourse I had to include a photo of the completely warm state of My Friend Dahlia. I think it looks kinda naked without the purple tips. I just got so used to looking at them throughout the day! There's also some holo mixed into the polish, but it's not super obvious. It might have been more visible if I had added a top coat. I feel like the 'speckles' take out some of the stronger holo. But I really like it this way too! It's just so subtle that it's only visible in REALLY strong light, and even then it's faint. You can't see it in regular every day lighting. Another polish in the Spring FX collection is Disguise The Limit and this is an interesting blue shimmer with strong holo sparkles. I'm not sure if the shimmer is really my style, but I can't deny the fact that this is a beautiful polish that is the color of the cloudless spring sky. I needed three coats of Disguise The Limit to reach opacity. It's really an easy polish to apply, no troubles and it dried quickly. I did apply a top coat this time, because it could use the little boost in shine. I think the pictures pretty much speak for themselves, non? ...there was NO sun in this dreary Dutch winter but I wanted to show you the holographic beauty of this polish, so I pointed my strong led light at my nails. Et voilá! Holo prettiness! This holo effect is way stronger than I've seen it in My Friend Dahlia! So... that's half of the Pretty & Polished Spring FX collection! You've seen my swatches of My Friend Dahlia and Disguise The Limit, both of these and the other two polishes in the collection will be released on March 1st (that's a Saturday, FYI). You can find these and other gorgeous creations in the Pretty & Polished webshop. You can also find their beautiful polish swatches & updates on Facebook, Twitter, Google Plus and Instagram. They're even on YouTube, go check it out! Thank you so much for reading and don't forget to share!!! Links for sharing are right down below the post!